For scissors hold out 2 fingers like a pair of scissors. For paper hold your hand out flat. For rock clench your hand into a fist. Count 1 , 2, 3 and then both players make one of the signs scissors, or paper or rock at the same time. Scissors beats paper, paper beats rock and rock beats scissors. It is a draw if both players make the same sign. Play the game with a friend. Is it a fair game? Do you both have the same chance of winning? If you play the game many times do you make each of the signs roughly the same number of times? 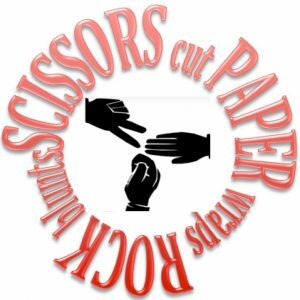 Are you equally likely to make the scissors sign, the paper sign or the rock sign? List all the different possible events that can happen each time you play this game. Chinese Splits: In China people play this game standing up facing their opponent. They start with their feet together and when they lose they step to one side so that their feet get further apart. After a while they are doing the splits. Play this game and see who can last longest before giving up or falling over?